CLEVELAND, April 4, 2018 /PRNewswire/ -- Forest City Realty Trust, Inc. (NYSE: FCEA) today announced that the company has received the 2018 ENERGY STAR Partner of the Year Award for outstanding efforts in energy management. Forest City's accomplishments will be recognized by the U.S. Environmental Protection Agency and the U.S. Department of Energy at a ceremony in Washington, D.C. on April 20, 2018. "Our strategic focus on environmental, social and governance (ESG) performance is driven by leveraging best-in-class systems and programs like ENERGY STAR to help create sustainable value for all of our stakeholders," said David J. LaRue, Forest City president and chief executive officer. "This ENERGY STAR Partner of the Year Award recognizes our associates' daily efforts to manage and reduce energy usage across our high-quality portfolio and their shared commitment to our core values." 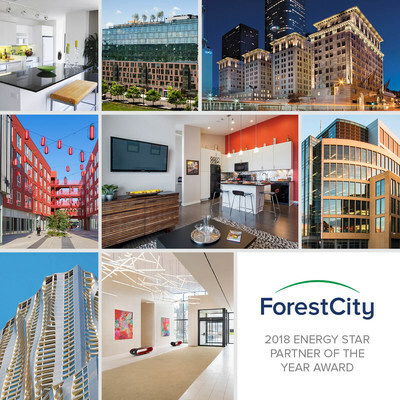 Forest City integrates ENERGY STAR into all aspects of its portfolio, from specifying efficient appliances in new construction to benchmarking 100 percent of its properties in Portfolio Manager, ENERGY STAR's energy management and tracking tool. "The 2018 ENERGY STAR Partners of the Year have demonstrated real leadership, showing how American families and businesses can save energy, save money, and reduce air emissions," said Bill Wehrum, EPA Assistant Administrator for Air and Radiation. Forest City earned recognition for promoting energy efficiency and ENERGY STAR, both within and outside its organization. The company has distinguished itself by integrating ENERGY STAR scores and training modules into its internal energy management platform, property energy dashboards and apartment positioning and leasing training materials. Improving our average portfolio ENERGY STAR score by 6 percent over 2016. Achieving ENERGY STAR Certification for six office and four multifamily residential properties. Requiring 100 percent of new homes built in its Stapleton community to be ENERGY STAR certified, representing the largest ENERGY STAR community in Colorado. Participating as a charter tenant in the ENERGY STAR Tenant Space pilot program with its new company headquarters in Cleveland, Ohio. 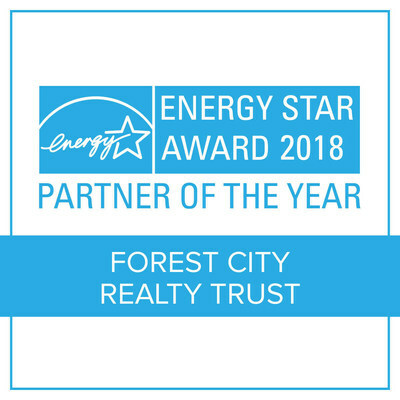 For more information about Forest City's Partner of the Year award, visit https://www.energystar.gov/about/content/forest_city_realty_trust_inc. For a complete list of 2018 winners and more information about ENERGY STAR's awards program, visit www.energystar.gov/awardwinners. Forest City Realty Trust, Inc. is a NYSE-listed national real estate company with $8.1 billion in consolidated assets. The Company is principally engaged in the ownership, development, management and acquisition of commercial and residential real estate throughout the United States. For more information, visit www.forestcity.net. ENERGY STAR® is the simple choice for energy efficiency. For over 25 years, EPA's ENERGY STAR program has been America's resource for saving energy and protecting the environment. Join the millions already making a difference at energystar.gov. More background information about ENERGY STAR can be found at energystar.gov/about and energystar.gov/numbers.